Stems: Erect, simple below inflorescence, glabrous or glabrescent. Leaves: Basal and cauline; petiole usually present on lower leaves, absent on upper leaves; blade lanceolate to elliptic, oblanceolate, deltate, or suborbiculate, or rarely linear, 2.4 to 10 inches long, .4 to 2.4 inches wide, base tapered to truncate or cordate, margins entire to irregularly dentate, dentate-serrate, or sinuate, tip obtuse to acute. Inflorescences: Heads radiate, 6-40 in corymb-like arrays. Involucres campanulate or cylindric, .3 to .6 inch x .3 to .6 inch. Calyculate bractlets 1-5, linear. 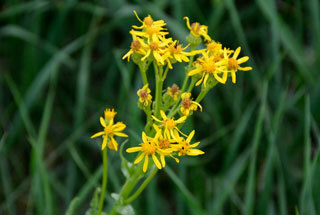 Phyllaries (8), 13, or 21, .2 to .55 inch, glabrous or sparsely tomentose proximally, apex usually green, rarely black. Flowers: Ray florets 8 or 13, pistillate, fertile; ligule .23 to .7 inch; corolla yellow or orange. Disk florets 10-80, bisexual, fertile; corolla yellow. Fruits: Achenes cylindric, usually 5-ribbed, .08 to .12 inch, glabrous; pappus of 30-80 white smooth or barbellate bristles, .2 to .27 inch. Seed 1. Comments: Kansas plants are var. integerrimus. Senecio, to grow hoary, alluding to the pappus resembling the white hair of an elderly person, and integerrimus, most whole, alluding to the leaves.